Activists with disabilities and allies from New York, Rhode Island and Massachusetts gathered at an 1199 Service Employees union hall in Dorchester, Mass., in August to commemorate people with disabilities whose collective struggle led to the Americans with Disabilities Act being signed into law on July 26, 1990. Organized by the People with Disabilities caucuses of the International Action Center, Peoples Power Assembly and Workers World Party, the gathering recognized the disability liberation movement as being inspired by the Civil Rights and liberation movements of people of color, women and lesbian, gay, bi, trans and queer people. 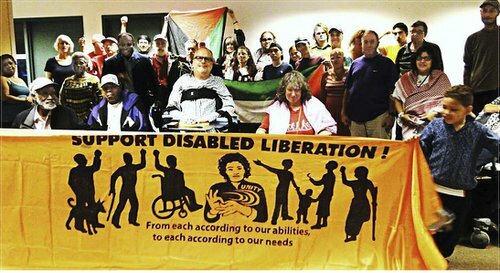 Solidarity permeated the meeting and discussion as participants strategized about the challenges that lay ahead to protect and enhance disability rights in the age of austerity. The meeting featured Communication Access Realtime Translation services, the instant translation of the spoken word into English text using a stenotype machine, notebook computer and realtime software that produced text projected on a large screen. This provided access to the program for participants with hearing impairment and other disabilities. The meeting also featured an artwork display supporting disability rights by Nan Genger, people’s artist and member of the Workers World Party People with Disabilities Caucus. Andre Francois, recording secretary of Local 8751, United Steelworkers, updated everyone on the struggle to overturn union-busting Veolia corporation’s firing of four union leaders, including Francois and Grievance Chair Steve Kirschbaum. Francois announced his union’s call for an end to the U.S. government’s discrimination against people with disabilities by excluding many disabled workers from the legal right to a minimum wage. John Kelly, of Second Thoughts Massachusetts and Not Dead Yet, spoke against the legalization of assisted suicide, which is targeting children and adults with disabilities. Kelly explained how this was practiced by Adolph Hitler’s Nazi regime, and how ending the lives of people with disabilities by identifying their conditions as “terminal” or “hopeless” saves money for big health insurers. Brian Shea recounted his decades of struggle in the Disabled Peoples Liberation Front, including chaining himself and his wheelchair to movie theaters and buses whose owners refused to make their services accessible to people with disabilities. Bill Bateman, coordinator of the Rhode Island Peoples Power Assembly, explained how austerity cuts devalue people with disabilities and seniors as if we were put on a barge to nowhere. Howie Rotman, of 1199 SEIU, explained how the June 30 U.S. Supreme Court decision in Harris v. Quinn jeopardizes the union membership of more than 40 percent of the home health aides who care for people with disabilities and whom his union represented. Joyce Chediac, a writer for Workers World newspaper, editor and contributing writer of “Gaza: Symbol of Resistance,” and a disabled activist from New York, spoke of the ravaging effects of war on people with disabilities in Gaza, where 15 percent of the population is disabled, according to the World Health Organization. She explained how this year’s bombings by Israel, using weapons paid for by U.S. tax dollars, raised the total number of homeless children in Gaza to 100,000, killed one child per hour, reduced electricity services to two hours a day, and destroyed many facilities for people with disabilities, including hospitals and rehabilitation centers. This reporter, a person with emotional and hearing loss disabilities, echoed previous speakers who urged all participants to endorse the petition of the National Federation of the Blind (see nfb.org/fair-wages) to establish minimum-wage rights for people with disabilities, and to protest the practices of Goodwill Industries and other companies of paying workers with disabilities as little as 22 cents a day. Expanding the $15-an-hour national minimum wage campaign to include and embrace people with disabilities, immigrants and prisoners was called for.